Hi everyone! 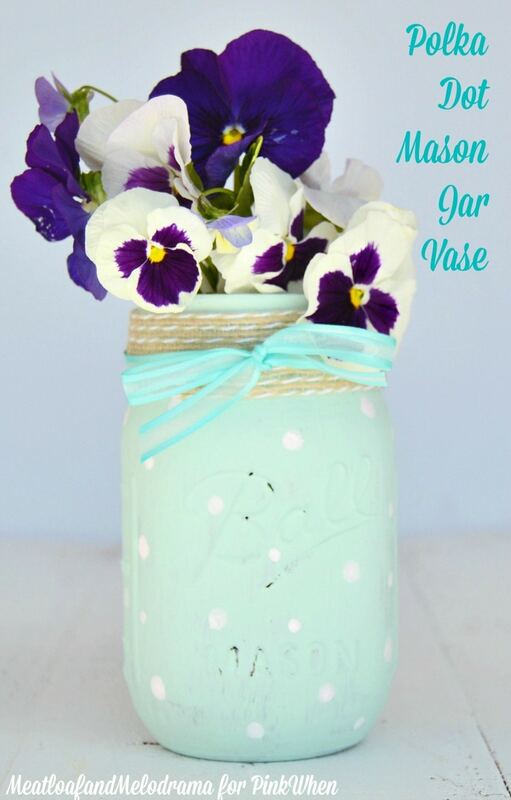 It’s Dee from Meatloaf and Melodrama, and I’m back again this month to show you a very simple, but sweet mason jar craft for spring. In fact, this little polka dot mason jar vase would make a perfect gift for Mother’s Day, and it can be used again and again. 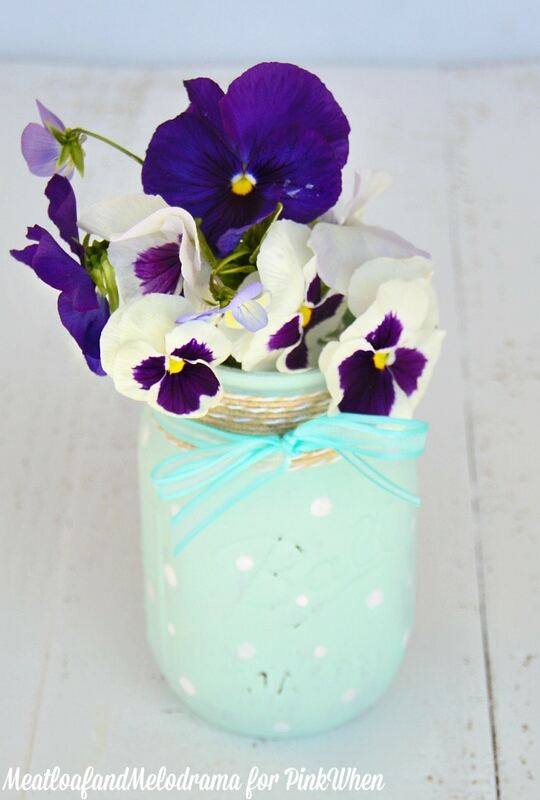 Or, if you’ve got a thing for mason jars like I do, you can even make some to give away to the moms and grandmas in your life and some extras to keep. It’s that easy! I love crafts that don’t take a ton of time to complete, and it’s an even bigger plus when they’re easy enough for the kids to help with, especially when it comes to making gifts. And if the craft involves paint, I can always find some willing volunteers. Best of all, you should be able to find all of the supplies in your local craft store. 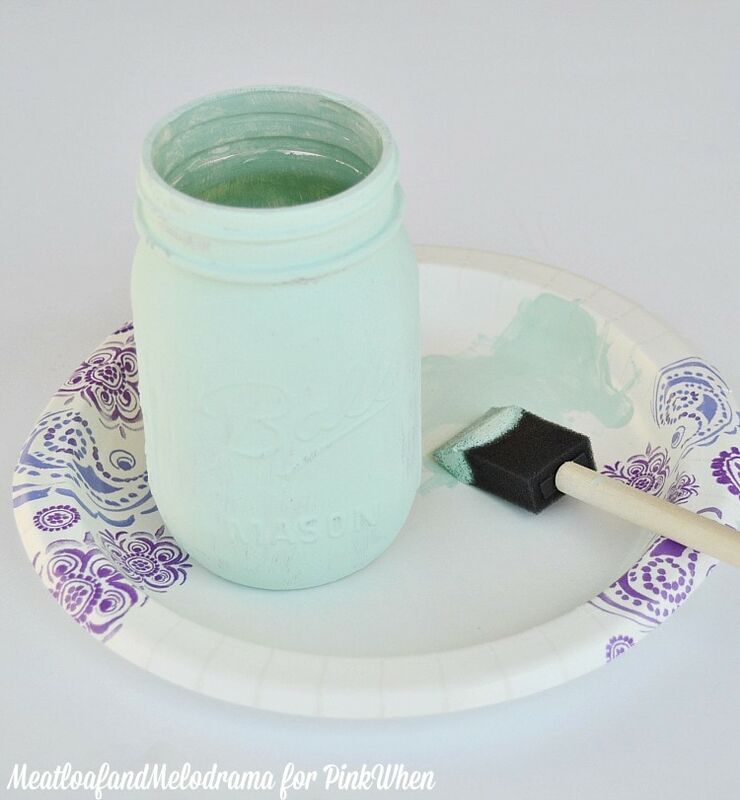 First, paint the entire jar with the color of your choice. I’m crushing on all things light green and aqua this spring, and this particular shade is called Refreshing. The nice thing about chalky paint is that it only takes a few minutes to dry. 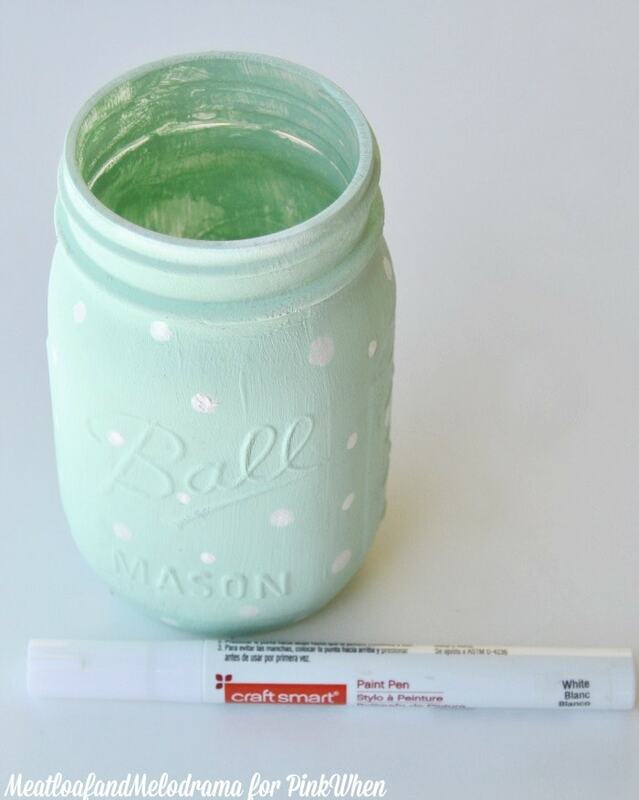 And when the paint was completely dry, I used a white paint pen to make polka dots all over the jar. If you can’t find a paint pen, you could easily make the dots with a pencil eraser and any white craft paint. I always like to add a little something extra to my painted mason jars, so I glued some fancy burlap ribbon around the neck of the jar. And then I tied some thin aqua ribbon over the burlap. To complete the project, I added some pretty pansies and violas from our yard. I just love these flowers, and we plant them every spring. And that’s all it took to create this sweet polka dot mason jar vase! I also distressed the front a little, but this part is totally optional. If you want to give the vase as a gift, you could add a tag with a handwritten message or even print one out. I think any mom would be thrilled to receive one of these. I know I would! I love it! Mason jars are so fun to decorate! I could sit all day and decorate them, if I had the time.